If you’ve been craving a Big Gulp or a Slurpee at Los Angeles International Airport, your troubles are over. The first 7-Eleven in a U.S. airport opened has opened at LAX – in the pre-security/arrivals area of the Tom Bradley International Terminal. Open from 6 a.m. to midnight and designed to serve departing and arriving passengers as well as airport employees and all the people who come to the airport to meet and greet passengers, the 950-square-foot shop is stocked with magazines and newspapers, travel-size personal care products and a variety of over-the-counter medicines for motion sickness and other ailments. This is the first in-terminal location for 7-Eleven in the U.S., but the company currently has three stores in airport plazas on U.S. airport properties near JFK, Newark Liberty and Southwest International Airport in Fort Myers, Florida. A 7-Eleven is also scheduled to open post-security in Terminal A at Dallas/Fort Worth International Airport this fall, with another in DFW Terminal E sometime in the future. 59 7-Eleven stores already operate in airports in 12 other countries, including Canada, where the world’s first airport 7-Eleven opened at Vancouver International Airport in 2001 and offers a full-service post office, a lottery outlet and a noodle stand. 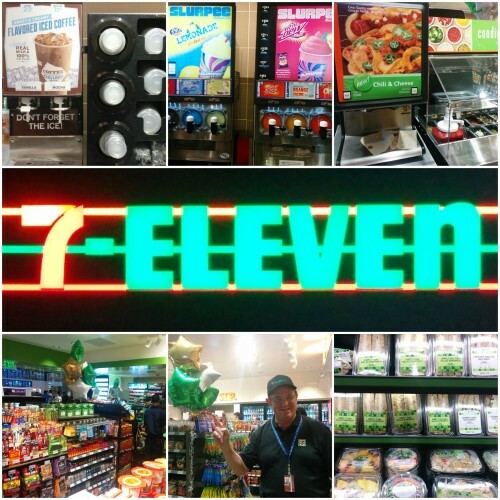 The Vancouver Airport 7-Eleven participates in 7-Eleven Day each year – when customers receives complimentary small size Slurpees – but the LAX airport 7-Eleven will not be participating that very popular program.